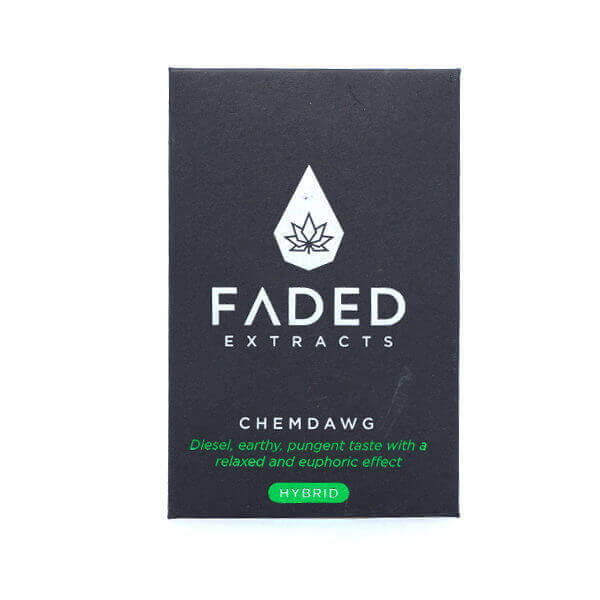 The Chemdawg Shatter by Faded Extracts is a legendary strain with an uncertain genetic history. While it is thought to be crossed from Thai and Nepalese sativa landraces by U.S. breeders, many have laid claim to this strain’s creation. Chemdawg’s origin stories include one account of a complicated seed exchange among fellow growers at a Grateful Dead concert and another tale pinning the strain’s parentage on a Colorado strain called Dog Bud (so named for its tendency to make the smoker roll over like a dog). Whatever its beginnings, Chemdawg has become a staple in the U.S. cannabis market for its unique taste and upbeat, energetic high. It has also been used to crossbreed several popular and successful strains. Chemdawg’s THC content has been measured at between 15% and 20%. Chemdawg Shatter has medium-sized buds that look slightly different from those of hybrid or pure indica lineage. Long and tapered rather than popcorn-like, the flowers have relatively loose and wispy leaves. The spring green leaves are covered in sticky white trichomes, lending buds a silver-white appearance. Due to the combination of their loose structure and resinous texture, buds of Chemdawg are particularly difficult to break up by hand — users preparing flowers for joints or pipes will have an easier time with a grinder. The sticky flowers are threaded through with red to orange pistils. Chemdawg has a smell reminiscent of diesel fuel (which many say is the source of the “chem” in its name). The pungent flowers also give off odors of earthy musk and some pine. As long as flowers are properly cured, this strain has smooth smoke that tastes sour and when inhaled. On the exhale, Chemdawg’s smoke betrays its signature diesel taste with an ammonia-like tang that hits the top of the palate. The high from the Chemdawg Shatter strain hits quickly, sometimes before users have had a chance to finish appreciating its distinctive diesel aroma. Smokers may experience a sharpening of the senses and an increased hyper-awareness of their surroundings. This initially disorienting head high becomes more productively cerebral and introspective in the right set and setting. The Chemdawg strain can lend itself to exuberant conversation. Its ability to amplify sensory experiences also makes it particularly good for creative endeavors. Many users report a palpable sense of physical relaxation — although nothing near couchlock — leading to some speculation that Chemdawg has some indica in its genetics as well. Chemdawg’s strong cerebral high has made it valuable in treating some of the symptoms associated with stress, anxiety, and even PTSD. Some fans of the strain describe relief from chronic pain and migraines as well. Because of its potency and mental focus, Chemdawg has the potential to trigger the kind of manic, recursive thinking that can lead to paranoia. As such, even users with a high tolerance for THC are advised to moderate their intake accordingly.